Before the beginning of this trading system it is recommended to read previously the clause “the Education guidance of pin bars”. - A long nose ( in comparison with a body ). - it should stand out very much forward. Trading strategy “Jankone for 5 minutes” consists of very simple 2 signals. But, to begin with remember that the best commercial transactions, trend transaction. So, the first trading signal is very simply, and you need only pin-bar ( read the clause ) and a market trend. If you have divergence it is even better. This is enough, and you need only to control your money, your plan and yourself. If you have more than 50 % of profitable commercial transactions ( and it isn’t difficult having this material ) you can get profit. After several months of trade, you will understand that the most important thing, is not to spend 85 % of time working with trading schedules, the most important thing, is not to search for any super new Forex the indicator or trading strategy, please, spend this time for the relation to trading. Learn itself! As a rule, strategy work, and Forex traders don’t. The trader becomes emotional ( greed, fear, impatience ) and makes mistakes, starts to break trading rules. What is necessary? You can test trading system what you likes, and work with it. If you begin trade on one system you can to get profit. You won’t find 5- minutes trading strategy which is easier. But, you should understand, that the most important thing is the trader, instead of trading system. Remember about fear and greed and don’t lose the control. 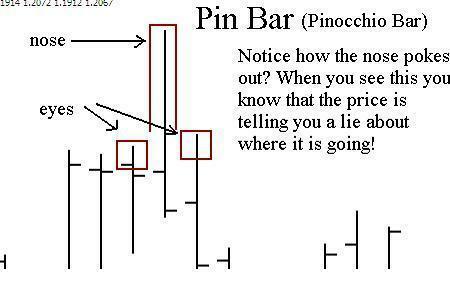 Trade is not pin bars, divergence, and so on, the trade is your brain! Traders will open one and the same commercial transaction, but someone will get profit, someone will be closed in the black, and someone will receive a loss. What’s the problem? Certainly matter is not in trading system, but it is in the trader. Everything that you need, it is simple trading tactic, your desire to succeed and the positive relation to trade. And the second trading signal, is called CT – counter trend – against a trend. Again, everything is very and very simply: divergence + pin. Look at the trading schedule, pin and divergence, this is an excellent transaction. 2. Indicator Bolinger Bands ( 18/2 ) – is used for trend determination. Still it is possible to trade from its borders with a lateral motion and at availability of pin. 3. Indicators 50 SMA and 21 EMA – for trend determination. 4. Currency steams: EUR/USD; EUR/JPY; GBP/USD and USD/JPY. Profit is + – 15 points, and at commercial transaction against a trend purpose 21 average is usual . Stoploss as a rule is some points more low/is higher than pin. But know, that your correlation of profit and a loss should be not less than 1 to 1.